Non-metal ceramic crowns are crows which are made from non-metal based products, and therefor are more similar to our teeth. Material from which are made was first invented from Switzerland firm Ivoclar Vivadent. There are no dark corners, and it has a perfect transparency and for them we can say that they are perfection in modern dentistry, which will give you back your natural smile, and brilliance of your teeth. Most people would never guess that you don’t have your own teeth. They are made from zirconium, which made making of these kind of crowns much easier. 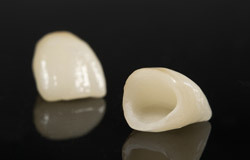 At first they take scanned computer print of your tooth, which is than used for precise grinding and cutting zirconium until the last half of a millimeter, and with detail polishing and ideal color, we get impecably aesthetic crown. Can I improve my smile with non-metal crown? Yes, with this procedure, you can make radical improvement. You can adjust color, shape, and spacing between teeth. Many famous people used this technique to get a perfect smile. Will I feel them, and is this procedure hurtful? When the crown is put on the tooth, you will neither feel it, nor will it hurt. Old tooth is grouded, and the crown is set which sits perfectly on your tooth, it is placed just a bit down the gym, by which gym are not at risk. This material is acceptable, and negative reactions are very rare. One tooth is different than the others. Can this treatment help? Yes, with ceramic crowns we can fix your problem. With the right color, shape and positioning we will make your smile better. In most cases their time of duration is from 8 up to 10 years. Ceramics is extremely durable and it is not likely to wear them off by chewing. Of course, if you make more appointments with us, and keep good oral hygiene, you can prolong lifetime of your crown to more than 10 years.